Nucleosomes are tightly packed bunches of DNA and protein which, when linked together as chromatin, form each of the 46 chromosomes found in human cells. The organization of DNA in nucleosomes is important not just for DNA packaging; it also forms the basis for the regulation of gene expression. By controlling the access to DNA, nucleosomes help facilitate all kinds of gene activity, from RNA transcription to DNA replication and repair. 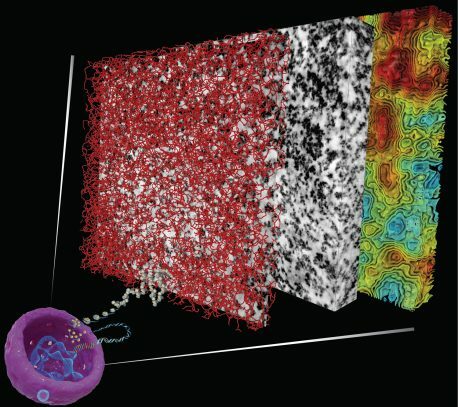 A research group led by Lois Pollack, professor of applied and engineering physics, used a combination of X-ray and fluorescence-based approaches to study how the shapes and compositions of nucleosomes change after being destabilized. The group’s paper, Asymmetric unwrapping of nucleosomal DNA propagates asymmetric opening and dissociation of the histone core, is published online in Proceedings of the National Academy of Sciences. Co-lead authors are postdoctoral researcher Yujie Chen and doctoral student Joshua Tokuda. 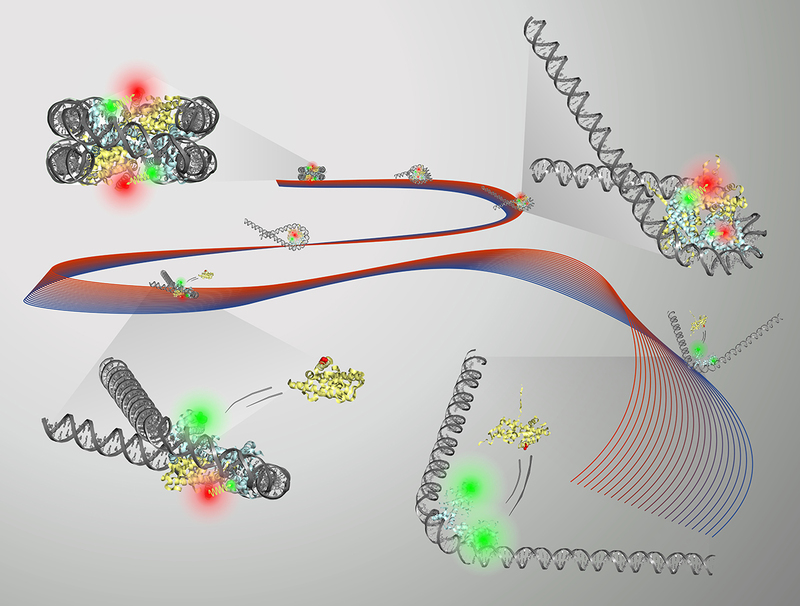 Using FRET, small-angle X-ray scattering and other methods, the group was able to get a clear picture of the DNA activity during unwrapping of the histone core. It was found that different DNA shapes were produced during the unwrapping process, most notably a “teardrop” shape that seemed to promote protein activity. The histone core goes from eight protein molecules to six when the DNA unwraps into the teardrop shape. “It’s as if having the DNA in this shape is a signal to the protein: ‘Hey, now’s the time. You want to change it up? Go ahead,’” Pollack said. This finding suggests that the molecular transition is guided by this specific type of unwrapping. It’s a step toward better understanding of DNA access during transcription, replication and repair. 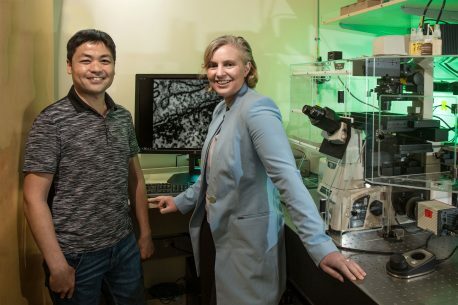 “The reason why these structures are so important, in addition to packaging, is that it also gives cells the opportunity to control which genes are on and off,” Tokuda said. Tokuda adds that misregulation of chromatin remodeling is also implicated in many human diseases, from neuro-development and degenerative disorders to immunodeficiency syndromes and cancer.